A unique festival of experimental, improvised, and noise music. 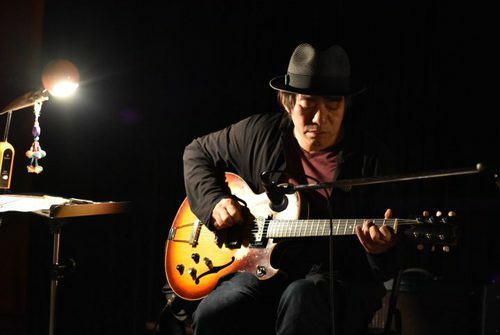 Asian Meeting Festival (AMF) was started by Otomo Yoshihide in 2005 to encourage more exchange between Asian and Japanese musicians. From 2014, Singaporean musician Yuen Chee Wai and Hong Kong based dj sniff joined the curatorial team, and it has become now one of Asia's most renowned festivals for experimental, improvised and noise music. This year the festival was held again with artist arriving from around Asia. 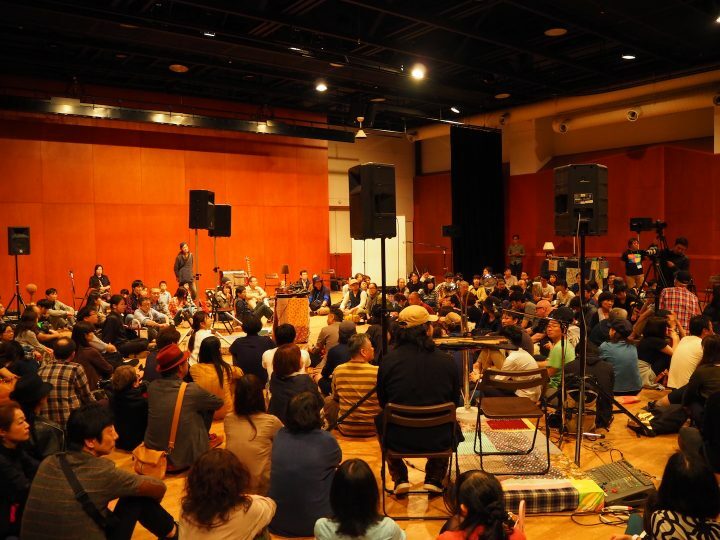 Concerts were played in Fukuoka, Kyoto, Sendai, and their tour ended with a two-day program on September 23 and 24 at the Sapporo International Art Festival (SIAF). AMF explores new possibilities in music together with artists coming from diverse backgrounds. So what kind of music did they play? 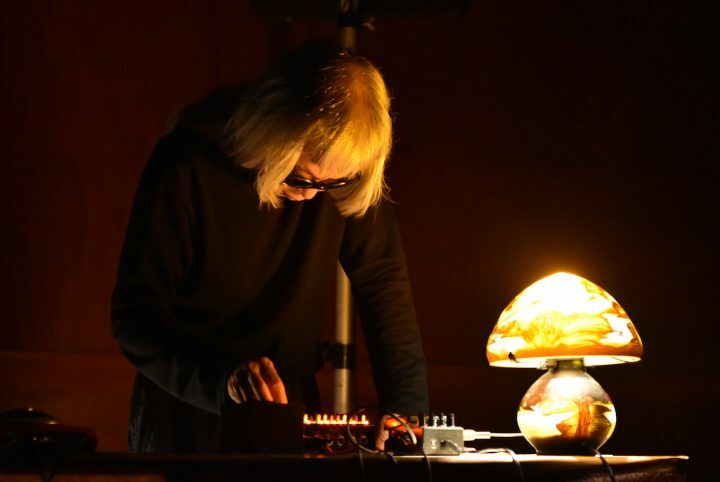 I am not particularly familiar with noise music but nevertheless I love music, and so I will try to introduce a new sensibility that was opened by AMF. ▲ It's rare to sit right next to the performers, and this built-up anticipation and anxiety towards the performance that was about begin. In the venue, small stages for the performers were prepared in two circles, where one larger circle surrounded another smaller circle. The audience was allowed to sit anywhere they liked. At a normal concert there is a stage and seating area, which clearly establishes the relationship between the audience and performer, but AMF is different. We could sit wherever we wanted to but that freedom accompanied an unsettling feeling whether it was the best spot to hear all of the sounds. Not after long, artists took each of their positions and the performance began. The lights in venue went out and the performers were lit only by small lamps beside them. This not only made the atmosphere mysterious but also allowed us to concentrate on just the sound and it's phenomenon. Their performing style would not be considered "standard", so for first-timers it may have been a surprise. 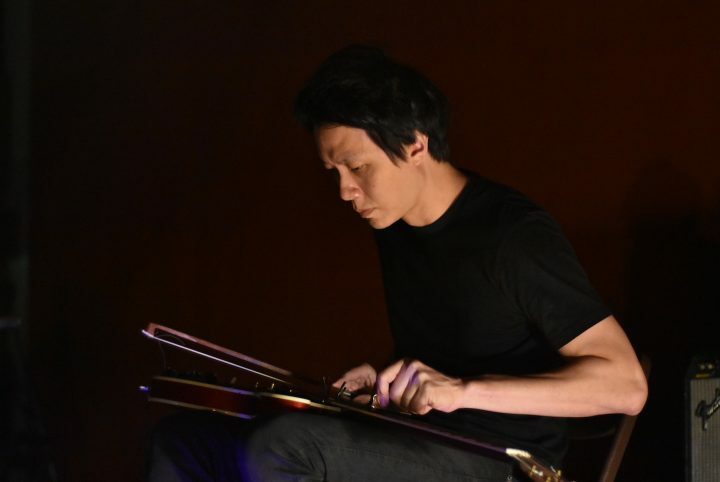 Yuen Chee Wai (Singapore) played his electric guitar with a bow, Yi Kah Hoe switched rapidly between different Chinese flutes, Alice Chang's (Tainan) voice performance sounded like a screeching object or an animal call. 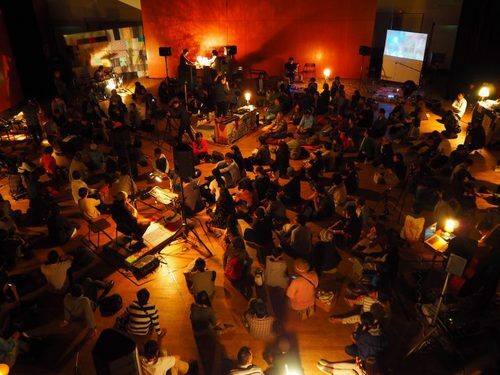 For two days, a total 18 artists played together in a completely unpredictable way. Sometimes the artists walked through the audience while they played. At first, one may think that they are all doing something unrelated to each other, but listening more closely, you will notice that this was an ensemble, each responding to each other's music and presence. The ensemble didn't play in unison, but each performer was tied together, delicately sensing the situation and making judgments on what sound to make and how to make it. Everyone projected their own sound and responded to what was returned by others. I felt that this was analogous to our struggles in this world, trying to find our place as individuals. Like our everyday experience, what you could hear and see varied drastically depending on where you were and this was very interesting. It was difficult to understand what was happening as a whole because the artists and the audience were spread out in a circle at the same eye level. Instead, there were concentrated moments where you had to focus your listening to try to understand what is happening around you. This experience allowed us to weave together our own music that only happened where you were. To the earlier concern I had about the best spot to hear all of the sounds, I would now answer to myself that it is not necessary to hear everything. If there is a sound that you want to hear you can move to that location, but this means that you will also lose track of another sound. The circles in the venue reminded me that our diverse experiences as individuals don't have a center but are nevertheless, complete. It is simply fun to learn about the possibilities of expression of an instrument or voice. Unconsciously we are conditioned to what is defined to be "normal", but at AMF even the familiar piano makes sounds that we have never heard before. 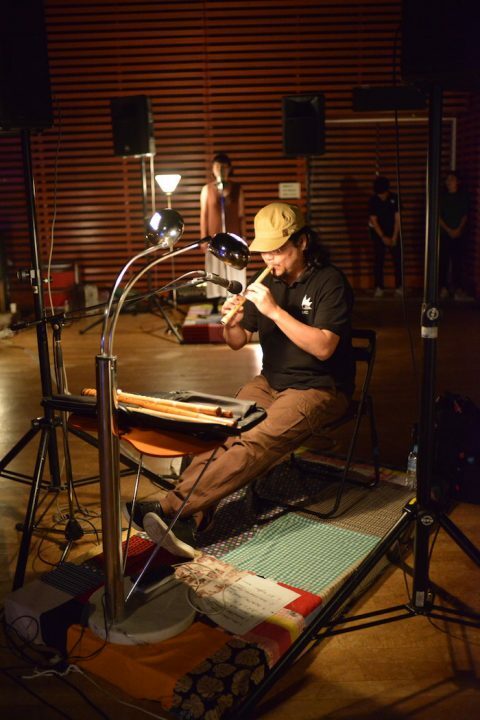 We are introduced to new ways of making music that is beyond our imagination through the many self-made instruments and devices that are also used. 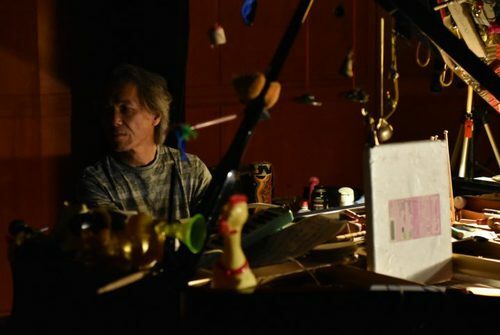 Even if we could imagine the individual sounds that these instruments and objects make, what about the music they make together? 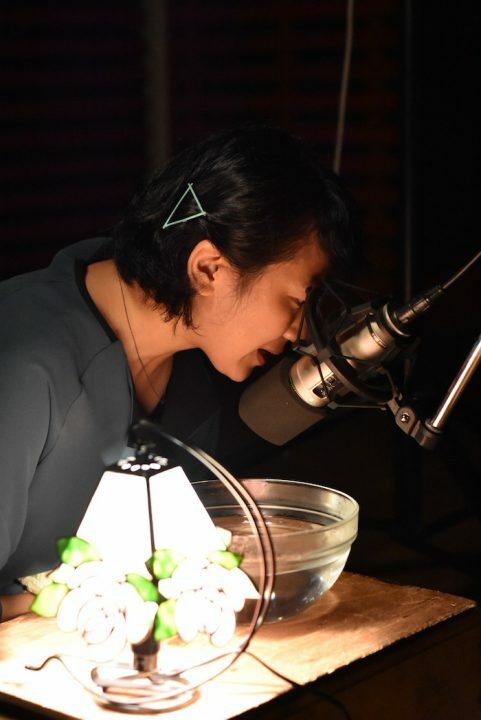 It may seem difficult with each having such strong personalities, but the sounds that appear to be unrelated are often carefully tied to each other on a deeper level. 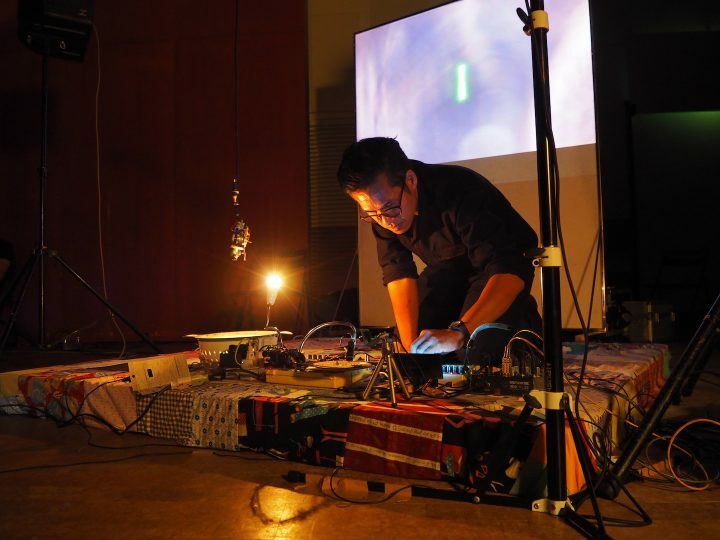 ▲Arnont Nongyao (Chiang Mai) say's he is interested in vibrations and his performances use many devices and combines light and sound. Some people might say "noise is not music." However, my experience at AMF did not make me deny anything but rather opposite and opened doors for me to sense new sounds. Even when performance that has sounds that you have never heard before, sometimes they will remind you of something that you heard in nature or in your daily life. Perhaps noise is sounds that are more familiar than we think they are. AMF was a memorable concert with each sound triggering strong memories within me. I truly recommend this experience.